Audi Q3 isn’t a model that needs special introduction; we have seen the success saga of it in automotive industry. Scheduled to make its debut at the 2016 Geneva Auto Show, Audi is all set to take curtains off its performance oriented version of RS Q3; Audi RS Q3 Performance 2017. The model gets some new touches to its exterior while beneath the hood is spectacular power. 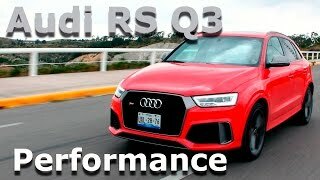 Let us have a look at the review of Audi RS Q3 Performance 2017 to know in detail about it. Being a performance oriented model, the interior of Audi RS Q3 Performance 2017 carries sports seats with an embossed entity ‘RS Q3’. In front of the sports seats we have a flat bottom three-spoke leather wrapped steering wheel featuring blue stitching to add contrast. The instrument cluster comprises standard gauge cluster but with new colors; this includes a black background with white lettering and red needles. There is a free-standing touch screen over the dash featuring the infotainment system while the center console and stack look pretty clean with their arrangements. 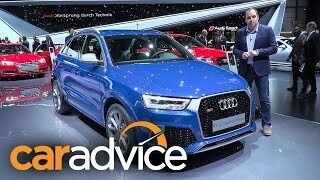 Thus rounding up the interior details of Audi RS Q3 Performance 2017 I would say it has simplicity with a blend of sportiveness to complement its performance figures. The exterior of Audi RS Q3 Performance 2017 has been designed to take the saga created till date a mile ahead. Starting with the front fascia the model gets adorned with a gloss black grille with honeycomb pattern. Beneath we have air ducts on either corners with the same honeycomb design and featuring titanium- like finishing. Moving to the rear end there is a sculpted diffuser dipped in gloss black while the newly integrated reflectors add to the entity. Looking at the bottom you’ll notice the exhaust outlets shaped oval sneaking from the diffuser. Thus rounding up the exterior details of Audi RS Q3 Performance 2017 I would say, the sportive saga continues at the both rear and front fascia commendably. 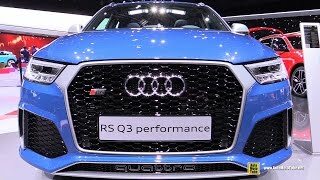 Powering the Audi RS Q3 Performance 2017 is a 2.5 liter TFSI engine cranking total output of 367 hp and peak torque of 465 nm paired to seven-speed S Tronic transmission which send the power to all four wheels. 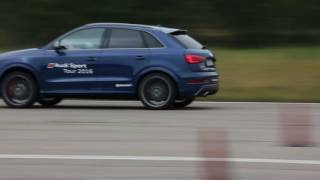 With this power figures the top speed of Audi RS Q3 Performance 2017 touches the mark of 167.8 mph while the 0-62 mph sprint can be knocked in just 4.4 seconds.